We spent several hours today trying to clean and organize the basement. While we made progress, it was way too slow and we didn't finish nearly as much as I was hoping. Progress is really slow because I'm determined to sort as we go and not just move this mess to another area of the house or garage. I'm always a little reluctant to show pictures of the basement—it was totally a mess. And even after many hours of effort, it's still a mess. Just less of one. 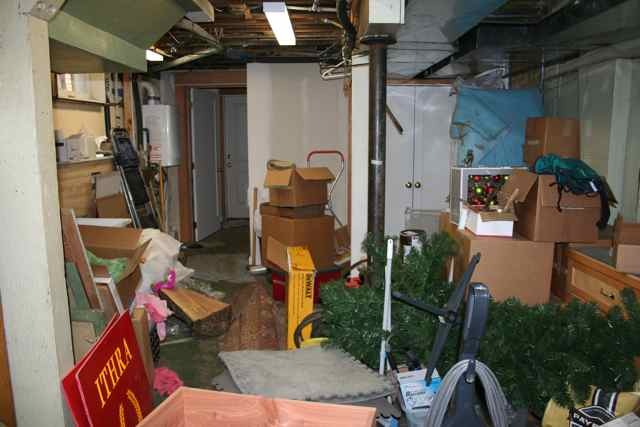 The front storage area was quite the disaster area. 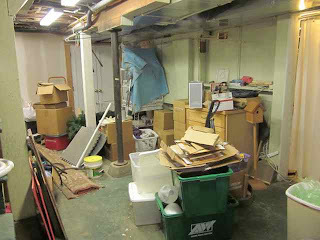 During the remodel we stowed an awful lot of misc. boxes in there. 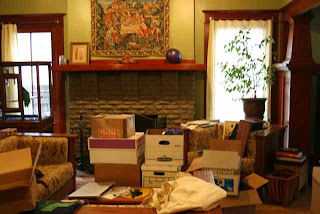 Plus we had the movers bring stuff back in December and some of that was piled in there too. Here's how it looked when we started today. By the end of the day, it looked like this. All organized and swept, but still messy looking. We pulled out all of the misc boxes to sort. 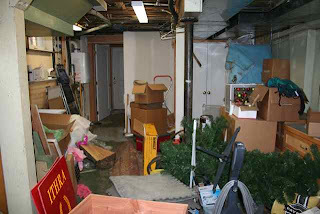 We also pulled out any boxes that belonged to other areas of the house and could be unpacked. And we organized the racks and filled any spaces with packed tubs from the family room area. Our current plan is to cram as much stuff as we can into this front storage area for the next couple of months while we finish the family room, and then we won't have to haul everything out to our paid storage and then back again. 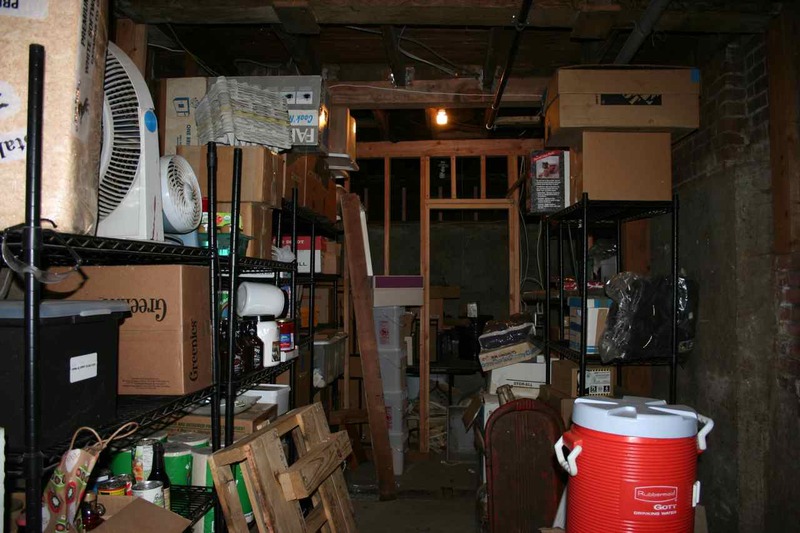 And we won't clutter up the garage during the project. It would be nice to have some space out there to work. 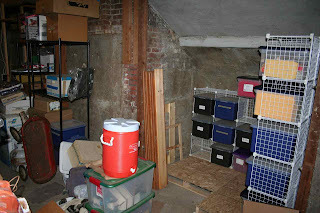 The left side of the basement looked like this when we started. Here is where we're at after our day of effort. Marginally better, but still a lot of work ahead of us. Ugh. Our living room, unfortunately, looked like this by the time we stopped working downstairs. We have sorted through a few boxes since taking this picture, but we've got a couple more to go. 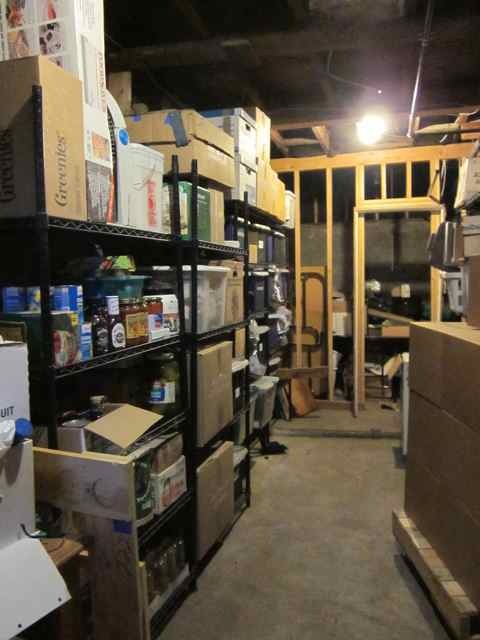 I think we'll have to have a garage sale this spring since we no longer get financial benefit from donations. (You have to have income to get the benefit from a write-off.) I so much prefer the donation route, but we'd be better off with a few bucks cash than a worthless paper receipt. Update the next day: We sifted the misc. boxes in the living room. It sort of sucked, but we did it and the mess is mostly contained into one pile ready for a garage sale or donation, which we have to find a place to stash. Jeff is a real trooper and just kept opening those awful boxes which I didn't feel like doing. That is a lot of projects you have going at once. I'd feel overwhelmed. How are you doing? I just keep trying to plug away at the list. If we keep working, I'm pretty sure we can get through it all. But if we start goofing off again, we'll have to trim the project list. 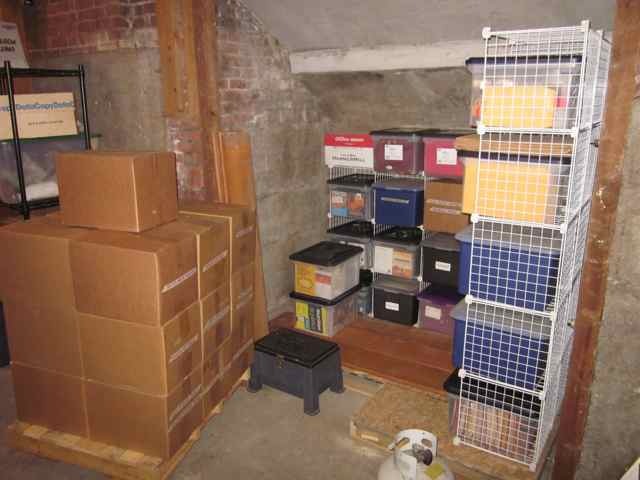 I'm dreading cleaning out our basement for when we move. It's full of stuff that hasn't seen the light of day since we moved in two and a half years ago. The pictures look familiar. I am glad you are making some progress. Are you still stuck down there? No, we mostly goofed off today. We've made a bit more progress since my post, but not enough. I'll probably get back to the basement this weekend. I can't work down there everyday--too gloomy.